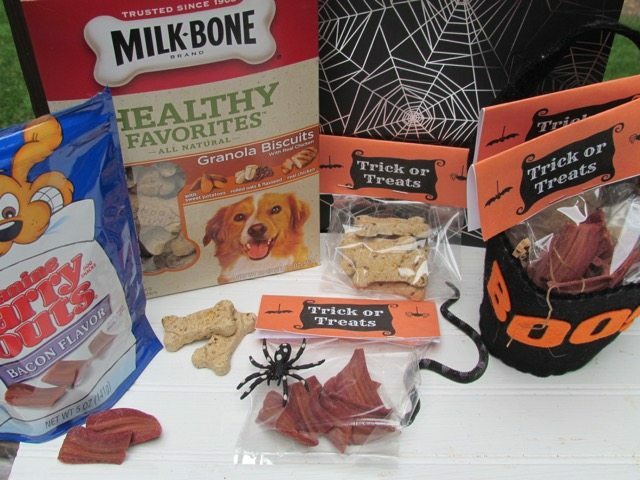 This shop about DIY Halloween Pet Treat Bags has been compensated by #CollectiveBias, Inc. and its advertiser. All opinions are mine alone. Halloween is one of our favorite holidays around here. It is a great excuse to make fun Halloween Recipes as well as decorate the house with fun Halloween Decor. But who says the people in your home have to have all the fun, this year we are dressing up Chloe in her Dog costume and making DIY Halloween Dog Treat Bags for our four-legged trick or treaters. 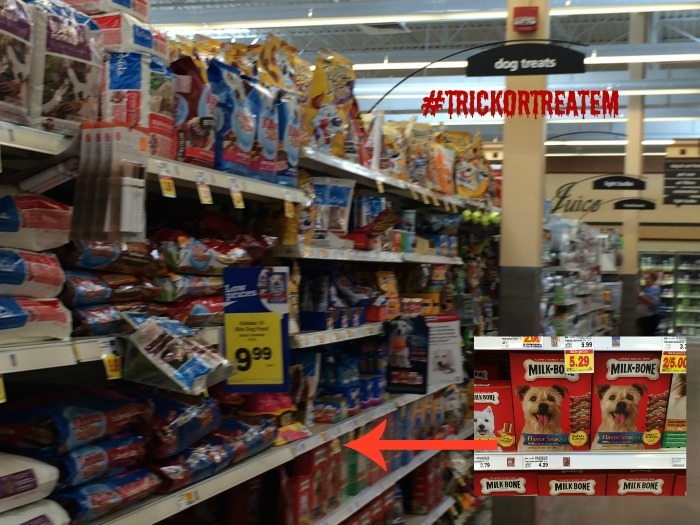 When it comes to dog treats, I don’t feel the need to run to a specialty store, I can pick up some of Chloe’s favorite dog treats while shopping at Kroger. 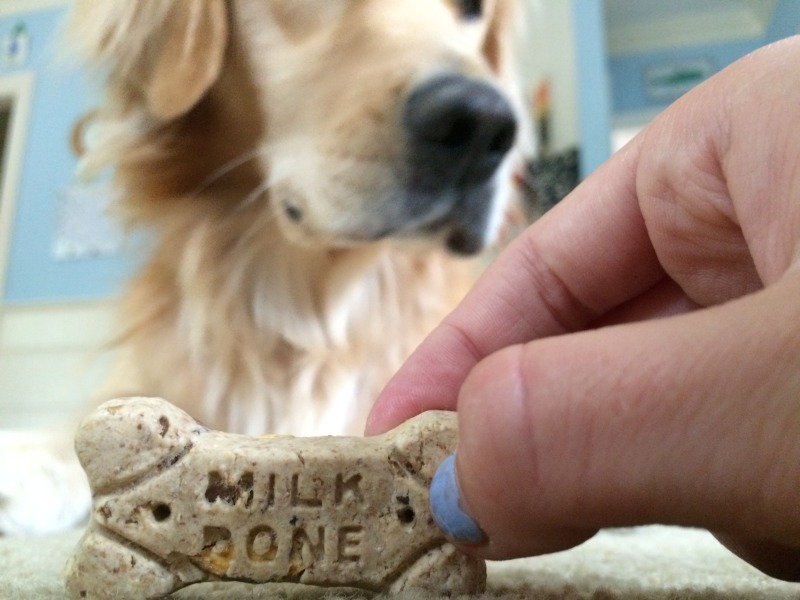 This week we picked up some of her favorite Milk Bone treats as well as some Bacon flavored Canine Carry Outs. You will find a great variety in the Kroger Pet Aisle, and you are sure to find something your dog already loves. We were inspired to make our Halloween Dog Treat Bags after visiting the #TrickorTreatEm Website. What fun to take a personality quiz on your dog and then create a fun Halloween Framed Photo. Best part, after doing all this you get a Kroger digital coupon to use towards some tasty treats; specifically MilkBone, Milo’s Kitchen, Pup-peroni ad Canine Carry Outs. Now for the Halloween Craft to share with your doggie friends. 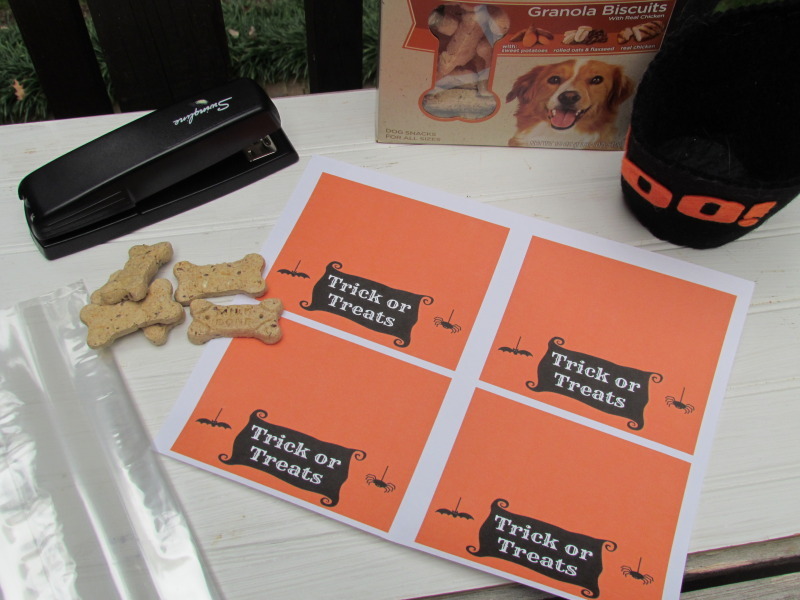 First print out this Doggy Treat Bag Free Printable and print it onto white paper stock. Each page contains 4 labels. Cut out only the orange part. Fill cellophane bags with your favorite dog treats. My cellophane bags were too big so I just cut off some off the top. Fold the top of the bag to seal, fold the tag in half and staple on the tag over the cellophane bag. Easy right, now fill a few different treats in the bags and let the dogs decide which ones they want. 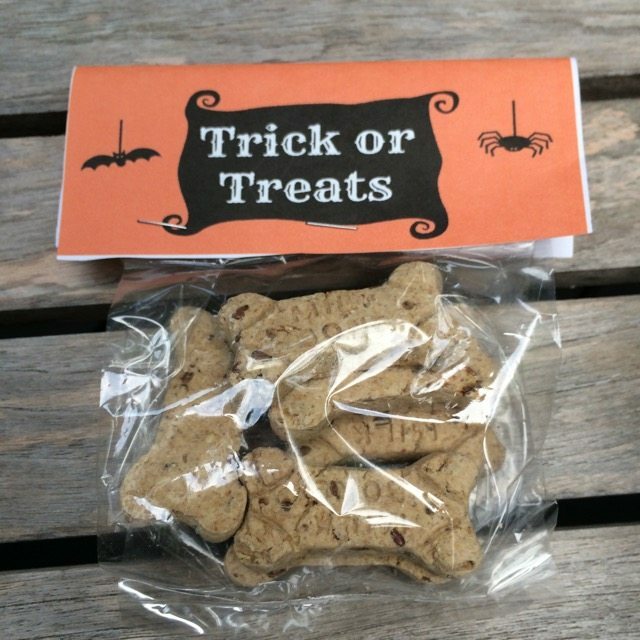 Remember, Halloween is not just for people, share these adorable and easy Halloween Treat Bags filled with some of your dogs favorite dog treats. Chloe is definitely ready to share with her friends. 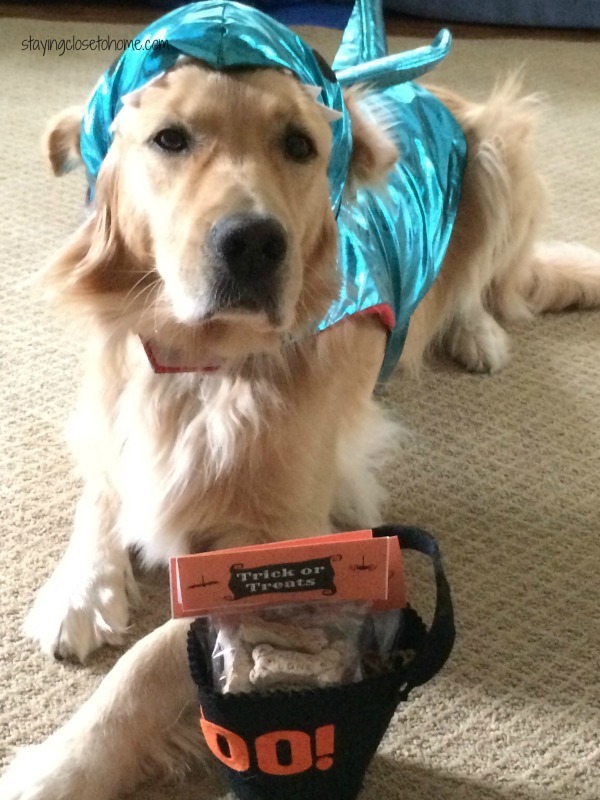 Do you take your dog trick or treating better yet do you dress them up in costumes? These are so neat – going to treat my neighbor’s dog Sadie! 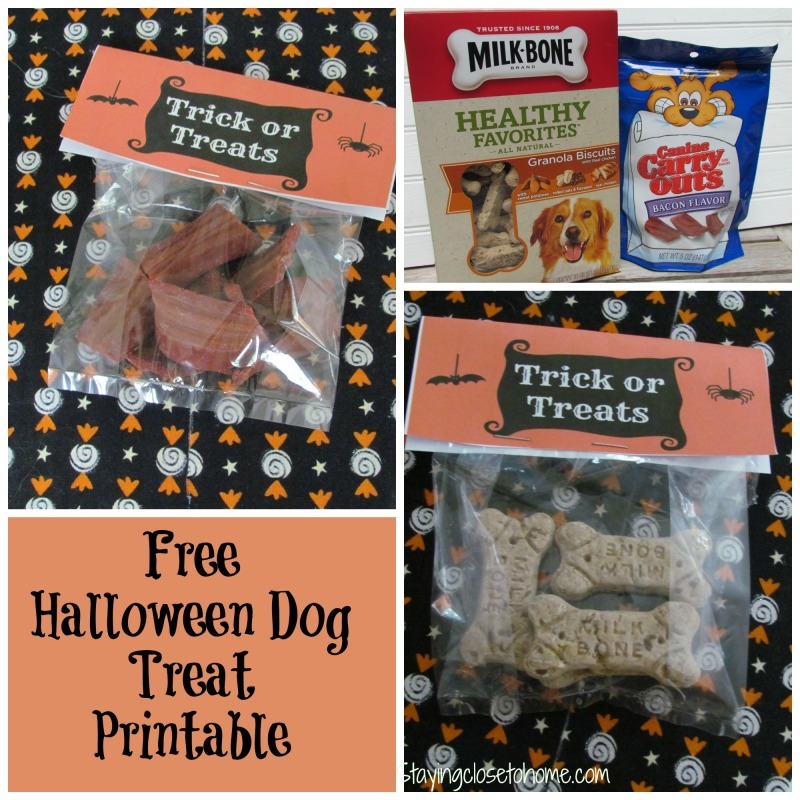 I love the idea of making Halloween Dog Treat Bags. I have 2 dogs and we visit the dog park almost every day. There are several dogs that I have become very attached to there and since Halloween is over I will make Christmas Dog Treat Bags. I will let each of the dogs sniff around and pick the one their nose finds the most interesting. Thanks for such a great idea. It will be a dog park hit. These are fun for pets! They should celebrate halloween too! The pet treat bags are such a great idea! Your doggie looks so cute in her costume! My dog loves Milo dog treats. Such a cute idea. I want to make my Old English Bulldog a Sherlock Holmes Costume! I think my dog would just be happy with it in her bowl or even on the floor sometimes! lol! She loves to vaccuum! What a cute idea! Fur babies deserve treats too! lol at the cute costume pic. Dogs gotta celebrate the holiday too! That is a fun idea. So cute! This is probably a fun idea for pet owners who celebrate Halloween. Aw how adorable! I always love including our doggies in the holiday festivities! I feel like such a bad puppy mommy. I’ve never gotten the dogs, rabbits or cats anything special for Halloween. Going to change that this year for sure thanks to this post. What an awesome idea. Our puppies would absolutely love these goodie bags. The furry kids should not be left out on Halloween. What a smart idea for the dogs that accompany the kiddies on Halloween! These look so cute and creative for the halloween! Although I don’t have any pets, I would really love to have one. My daughter loves puppies! We just got a puppy and my kids will get a kick out of making him his own Halloween treats. What a cute and thoughtful idea! There will be some very happy pups this Halloween. Those bags are adorable and your dog is very good to be so patient about getting one! What an adorable idea! Shared on Twitter. They turned out great, too. This is a great idea. There is always so many pets traveling with the kids this is perfect. Such a cute idea. My dog, Milo, would love a treat this Halloween.